NEW YORK — Baylor fell out of the top five for the first time in nearly a year after losing at Stanford. The Lady Bears dropped from third to sixth in The Associated Press women’s basketball poll on Monday after losing 68-63 on Saturday to the then-No. 11 Cardinal. 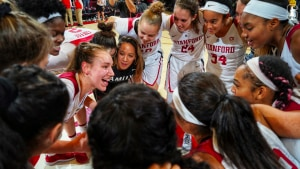 Stanford moved up to eighth. Kim Mulkey’s team last was ranked outside the top five on Jan. 1, 2018, when Baylor was No. 6. UConn and Notre Dame still are the top two teams in the country. The Huskies are the unanimous No. 1 team from the 31-member national media panel. They had the week off for exams. UConn plays its next four games on the road with stops at Oklahoma, No. 14 California, Baylor and Houston over the next few weeks. Notre Dame routed Binghamton and hosts Western Kentucky on Wednesday before visiting No. 19 Marquette on Saturday. Louisville, Mississippi State and Maryland round out the first five teams in the poll. 2️⃣7️⃣ assists, 1️⃣ team victory. Texas A&M re-entered the AP Top 25 at No. 23 after edging Oregon State 76-70 in Hawaii over the weekend. The Beavers fell to 11th. Missouri fell out of the poll after losing to a strong South Dakota squad. STAYING ALIVE: South Carolina kept its streak of being ranked going after beating Purdue in double OT on Sunday. The 25th-ranked Gamecocks have been in the poll for 115 consecutive weeks — the fifth longest active streak. That run started on Dec. 10, 2012. Dawn Staley’s squad hosts Temple and Furman before beginning SEC play at Texas A&M on Jan. 3. GAME OF THE WEEK: Fourth-ranked Mississippi State visits No. 7 Oregon on Tuesday. This will be the third Top 25 team that the Bulldogs have faced in the past four games. They routed Texas before edging Marquette.